The Roman Curia created the concept of legal fictions– trusts, foundations, and other corporations for good reasons– however, legal fictions can be misused. By Maxim of Law, those who create are responsible for their creations. It follows that the Roman Curia is responsible for the proper functioning of all corporations worldwide. As of September 1, 2013, Pope Francis declared all corporations and corporate officers fully liable for their errors and omissions. This means you. Also by Maxim of Law, there is no statute of limitation on fraud. Privately owned governmental services corporations have been fraudulently passing themselves off as the “government of the United States” since 1862. The longevity of this fraud in no way imbues it with authority. As an employee of these corporations you have no public office and no public bond and no foreign state immunity. Federal Law Enforcement Personnel— except U.S. Marshals: Your status is that of a Mall Cop acting outside the Mall. You have no authority on the land jurisdiction of the Continental United States. You are acting under color of law when addressing Citizens of the Continental United States “as if” they were Citizens of the Federal United States. If you threaten any living inhabitant of the Continental United States with a gun, taser, or other weapon, you can be hung as an inland pirate. If you remove any livestock you can be hung as a cattle rustler. If you cause any harm, you can be sued without limit. If you wear any uniform or display any badge or use any name or office designed to deceive or project authority you do not have, you can be arrested for impersonating an officer. You are acting in a purely private capacity and have only equal Civil Rights that may be withdrawn at any time. You are also acting under Martial Law and may face extreme punishment for infractions against the civilian populace. Acts of plunder, mortal violence, and mischaracterization of civilians as combatants are all death penalty offenses. U.S. Marshals are allowed full egress within the Continental United States so long as they are sworn and acting as officers sworn to uphold the actual Constitution, are not acting deceptively, nor acting outside their international jurisdiction while in pursuit of their duty protecting the U.S. Mail. Lawyers, Judges, Court Clerks— When you address birthright Citizens of the Continental United States in the foreign jurisdiction of the Federal United States or that of a Federal State, and deliberately confuse living people with corporate franchises merely named after them, you commit personage. This results in press-ganging land assets into the international jurisdiction of the sea, a crime outlawed worldwide for 200 years. It is a recognized act of inland piracy and it carries the death penalty. Mischaracterizing the identity or citizenship status of a birthright Citizen of the Continental United States is also a crime under the Geneva Protocols of 1949, Volume II, Article 3. It also carries the Death Penalty. Finally, no member of the Bar Association may sit upon the bench of any public court nor occupy any public office of the Continental United States including Congress. The involvement of any Bar Member automatically voids all proceedings pretending subject matter jurisdiction related to the actual land or its assets—including the people of the Continental United States. The Titles of Nobility Amendment adopted and ratified prior to the American Civil War has not been repealed. The Federal United States and the Municipality of Washington, DC all operate under the auspices of the United Nations and are signatories of the Universal Right of Self-Declaration. Anyone claiming to be a Citizen of the Continental United States having a valid Birth Certificate must be treated as such. Any debts or charges whatsoever related to vessels in commerce operated under his or her name by the Federal United States, any Federal State, the Washington DC Municipality or the UNITED NATIONS must be discharged according to Maxim of Law already cited: you are responsible for what you create. The Federal United States and its Federal States have created numerous vessels in commerce merely named after living Citizens of the Continental United States and styled in the form: John Quincy Adams. The Washington DC Municipality has similarly indulged in this practice and created franchises for itself named after living Citizens of the Continental United States styled in the form: JOHN QUINCY ADAMS. Most recently the UNITED NATIONS has created public utilities and is operating them under names styled as: JOHN Q. ADAMS. The organizations that have created these franchises are completely, 100% liable for their debts and obligations without exception and without recourse to claim upon the living people these franchises are named after. You may not presume that the living people have consensually agreed to be subjected to statutory law. You may not presume that they consensually agreed to be obligated for the debts of any legal fiction personas which have been created and named after them by Third Parties secretively operating in a private capacity and merely claiming to represent the victims of this fraud. This is your Due Notice that the living people inhabiting the Continental United States are presenting themselves and may not be addressed as if they belong to, are responsible for, or indebted in behalf of any legal fiction personas operated under their given names by any international corporation. Any continuance of any such claims and repugnant practices will be deemed immediate cause to liquidate the American Bar Association as a criminal syndicate and to deport its members from our shores. International action is underway to secure the assets and credit owed to the victims. Please read, research, and do your own due diligence. You are fully responsible for obeying the Public Law of the Continental United States including Revised Statute 2561 and The Right to Travel Page 18 Constitution. Please respect the established jurisdictions of air, land, and sea— and be aware that you may be arrested and fined or worse for failure to do so Issued this fifth day of April 2015, Judge Anna Maria Riezinger, Alaska State Superior Court. ………………….. The Orders by Pope Francis that ALL “public officials” that are under the jurisdiction of the Vatican City State do no longer have Immunity for the crimes they commit, Primarily Judges in America which includes the BAR Association. APOSTOLIC LETTER ISSUED MOTU PROPRIO. 1096 Roman Catholic crusaders slaughter half the Bible Believers in Worms, Germany. 1099 Roman Catholic crusaders massacre 70,000 Muslims, Jews, and Bible Believers when they capture Jerusalem. 1236 Roman Catholic crusaders slaughter Bible Believers in the Anjou and Poitou regions of western France. The Catholic crusaders trample to death under their horses 3000 Jews who refuse baptism. 1243 Roman Catholic mobs burn alive all Bible Believers in Berlitz, Germany (near Berlin). 1298 Roman Catholic mobs burn alive all Bible Believers in Rottingen, Germany. 1349 Roman Catholic mobs burn to death all Bible Believers in Germersheim, Germany. 1389 Roman Catholic mobs murder 3000 Bible Believers in Prague when they refuse to be baptized. 1540 – 1570 Roman Catholic armies butcher at least 900,000 Waldensian Bible Believers of all ages during this 30-year period. 1553 – 1558 Roman Catholic Queen Mary I of England (aka “bloody Mary”) attempts to bring England back under the yoke of papal tyranny. During her reign, approximately 200 men and woman are burned to death at the sake. Her victims include bishops, scholars, and other Protestant leaders. 1572 St. Bartholomew’s Day Massacre. French Roman Catholic soldiers begin killing Protestants in Paris on the night of August 24, 1572. The soldiers kill at least 10,000 Protestants during the first three days. At least 8000 more Protestants are killed as the slaughter spreads to the countryside. 1618 – 1648 The Thirty Years’ War. 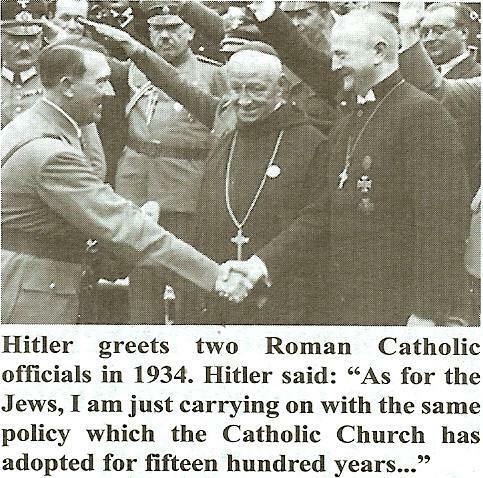 This bloody, religious war is planned, instigated, and orchestrated by the Roman Catholic Jesuit order and its agents in an attempt to exterminate all the Protestants in Europe. Many countries in central Europe lose up to half their population. 1641 – 1649 Eight years of Jesuit-instigated Roman Catholic butchery of Irish Protestants claims the lives of at least 100,000 Protestants. 1685 French Roman Catholic soldiers slaughter approximately 500,000 French Protestant Huguenots on the orders of Roman Catholic King Louis 14 of France. 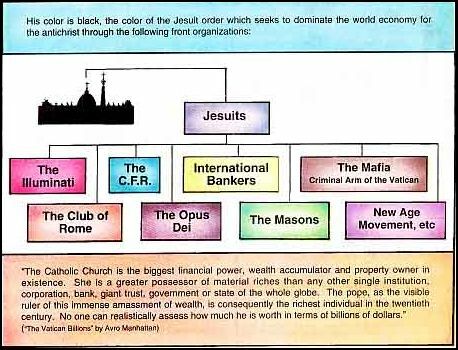 1911 Jesuits sink Titanic clone on purpose to murder rich anti federal reserve Americans. 1913 Federal Reserve is put into place, taxes directly sent to Vatican’s banking capital. 1938 – 1945 Circa Catholic dictators such as Adolf Hitler and Monsignor Tiso slaughter over six million innocent people in Europe prior to and during World War 2. 1941 – 1945 The Roman Catholic Ustashi in the fascist state of Croatia butcher up to one million Serbian Orthodox Christians. Roman Catholic killer squads are often led by Franciscan priests, monks, and friars. This genocide is choreographed by two Jesuit prelates: Aloysius Stepinac and Ivan Saric. Present Day International Bank / IMF in every country except two. ???? America no longer needed to control other regions with military force, American people huge drain on vatican resources. Timed collapse of the United States of America. When a Jesuit of the minor rank is to be elevated to command, he is conducted into the Chapel of the Convent of the Order, where there are only three others present, the principal or Superior standing in front of the altar. On either side stands a monk, one of whom holds a banner of yellow and white, which are the Papal colours, and the other a black banner with a dagger and red cross above a skull and crossbones, with the wordINRI, and below them the words IUSTUM NECAR REGES IMPIUS. The meaning of which is: It is just to exterminate or annihilate impious or heretical Kings, Governments, or Rulers. You will now rise to your feet and I will instruct you in the Catechism necessary to make yourself known to any member of the Society of Jesus belonging to this rank. In the first place, you, as a Brother Jesuit, will with another mutually make the ordinary sign of the cross as any ordinary Roman Catholic would; then one crosses his wrists, the palms of his hands open, and the other in answer crosses his feet, one above the other; the first points with forefinger of the right hand to the centre of the palm of the left, the other with the forefinger of the left hand points to the centre of the palm of the right; the first then with his right hand makes a circle around his head, touching it; the other then with the forefinger of his left hand touches the left side of his body just below his heart; the first then with his right hand draws it across the throat of the other, and the latter then with a dagger down the stomach and abdomen of the first. The first then says Iustum; and the other answers Necar; the first Reges; the other answers Impious. The first will then present a small piece of paper folded in a peculiar manner, four times, which the other will cut longitudinally and on opening the name Jesu will be found written upon the head and arms of a cross three times.